It was fifty years ago today! For those of you who don’t know, the Beatles are our favorite band in the history of sound, and this is a very special day for any Beatlemaniac. It was exactly a half century ago that the Fab Four made their iconic debut on The Ed Sullivan Show, giving Americans their first chance to truly meet the Beatles! In recent weeks the internet has been flooded with are a wealth of wonderfully-written articles detailing exactly why the John, Paul, George and Ringo were so incredible. Obviously we share the same sentiment, but we’d like to offer a little something different to the mix. As the Beatles’ beloved songs have influenced generations of songwriters, we’ve decided to celebrate this special day by taking a look at the songs that influenced them. Read on for some of the band’s favorite songs, which actually inspired some of their most famous classics. Merry Beat-mas, one and all! This soul stomper from the late-great Parker was a firm favorite of John Lennon’s. In fact, he even had it in his personal jukebox! John claimed that the tune inspired their 1966 single “Day Tripper,” but it also sounds like John had the recurring guitar-riff and bossa nova-flavored drum beats in mind when writing “I Feel Fine.” Of course, all three awesome tracks are in our personal (iTunes) jukebox. Also found in Lennon’s private jukebox stock, Channel’s hit song was influential for featuring a chromatic harmonica break that repeated over the chorus. 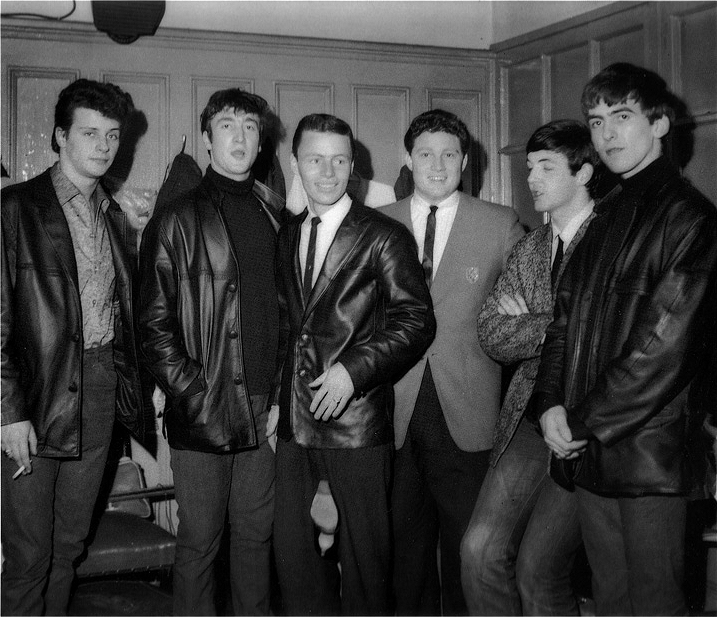 The Beatles opened for Channel at a Merseyside gig in early ’62, and John was able to hang out with his harmonica player Delbert McClinton. Although McClinton didn’t TEACH him the instrument (he’d already been playing since he was a kid), they definitely swapped tips. Years later, John admitted that the bluesy figure in the Beatles’ first single was inspired by the tune, as well as the (less bluesy) “I Remember You” by Frank Ifield. One of the earliest songs on the list, Paul McCartney wrote it with John Lennon while huddled in his childhood living-room. Although the melody and lyrics are their own (including the amusing original opener, “She was just seventeen, never been a beauty queen”), McCartney admitted to lifting the distinctive bass line note-for-note from a then-recent Chuck Berry single. “I played exactly the same notes as he did and it fitted our number perfectly,” he says in Barry Miles’ Many Years From Now. “Even now, when I tell people, I find few of them believe me!” John also seems to have borrowed the chugging rhythm guitar slashes for his part, too. As Sir Paul charmingly explains in many concerts and interviews, George and Paul learned this classical piece back in their Liverpool days to impress women at parties. Learning the whole number was a bit too time consuming, so they improvised a neat little ending for their abbreviated version featuring melody and bass notes played simultaneously on the upper and lower strings. Years later during the recording of what would be called The White Album, Paul latched onto the part that he’d made up and expanded it into the intro to one of his most beloved songs…which later became our piece to impress women at parties! On the surface, “Lady Madonna” is most obviously influenced by the rollicking piano of New Orleans rock pioneer Fats Domino, —particularly “Blue Monday”, which chronicles a week in the life of a hard working man. Paul McCartney decided to write the female equivalent.”It reminded me of Fats Domino for some reason, so I started singing a Fats Domino impression,” he told Barry Miles in 1994. “It took my voice to a very odd place.” Fats provided the spiritual bravado, but musically McCartney borrowed more from the piano part to Humphrey Lyttleton’s 1956 trad-jazz track “Bad Penny Blues,” which was actually recorded by the Beatles’ producer George Martin. These opening lines (and the backing echo) provided the germ of an idea for the tune, which went on to be sung by George Harrison. John was never fearful of borrowing lyrics, repurposing lines from Elvis Presley’s “Baby Let’s Play House” to open “Run For Your Life,” and also from Chuck Berry’s “You Can’t Catch Me” for “Come Together.” More on that one later… (spoiler alert: they caught him). A bit of an obscure cut, this one is for the true Beatlemaniacs in the crowd. The long and winding number was recorded in ’67, but shelved for a few years before surfacing on the Yellow Submarine soundtrack, a grab-bag of previous releases, studio off-cuts, and the odd new song or two. Although not terribly well known, it’s an extremely interesting track, weaving in musical tributes from not only Jeremiah Clarke’s trumpet-led “Prince of Denmark’s March,” but also this song originally by American group the McCoys (although probably better known to the Beatles from the version by British Invasion band, the Merseys). Clearly the Beatles were in a sampling mood in 1967, as they used a similar technique for “All You Need Is Love;” incorporating Benny Goodman’s “In The Mood,” the classical piece “Greensleeves” for the outro, and the French anthem, “La Marseillaise” for the intro. When John Lennon first penned “Come Together” as a campaign song for acid guru Timothy Leary’s aborted gubernatorial run, it relied heavily on Chuck Berry’s classic. Lennon was a MASSIVE fan, and was once quoted as saying, “If you tried to give rock and roll another name, you might call it ’Chuck Berry. '” He even added the line “Here come ol’ flattop, he come groovin’ up slowly,” which was dangerously similar to Berry’s original: “Here come a flattop, he was movin’ up with me.” John slowed the tempo considerably during recording, and McCartney’s swampy bass-line rendered the source song unrecognizable to most. Chuck even performed with John in early 1972 on The Mike Douglas Show, and all seemed cool! But it didn’t get by Berry’s song publisher, Morris Levy. He filed a copyright infringement lawsuit against Lennon, and the two settled out of court with the understanding that John would record three songs owned by Levy. As a result of the settlement, John released his own version of “You Can’t Catch Me” on his 1975 Rock ’n’ Roll album. It’s not too shabby. This is just a personal theory, but they do sound weirdly similar!